Posted on 23/02/2015 by Ed Sutton	in Autonomy, Conversations, Hearth & Home and tagged Dilar Dirik, Feminism, Kurdistan, Rojava, This is Hell!. Transcribed from the 21 February 2015 episode of This is Hell! Radio and printed with permission. Edited for space and readability. Although we have cut this transcript down significantly less than we generally do, we strongly encourage you to listen to the audio, to fully appreciate the emotional intensity of the conversation. Chuck Mertz: We’ve been talking about all the new challenges to the traditional seats of power around the world, from the Islamic State and how it challenges our notion of the modern state, to SYRIZA and how they’re standing up to the Eurozone’s austerity policies, to Spain’s Podemos, who have created a whole new form of democracy, even to the extra-statecraft of free trade zones that exist outside nations’ and a people’s laws. But there’s something completely unique happening in Western Kurdistan, a new kind of democracy, and it’s led by women, and they are fighting and beating the Islamic State. Here to tell us about Rojava, Kurdish refugee Dilar Dirik is an activist of the Kurdish women’s movement, and a Ph.D. candidate in the sociology department of the University of Cambridge, where her research focuses on Kurdistan, the Kurdish Women’s Movement, and the PYD (Democratic Union Party) which has existed in the Rojava territories since 2004. Posted on 02/12/2014 by Ed Sutton	in Conversations, Solidarity, Streets & Squares and tagged Anarchism, DAF, Kurdistan, Meydan Gazetesi, Rojava. AntiNote: This interview with members of Devrimci Anarşist Faaliyet (Revolutionary Anarchist Action, or DAF) first appeared in Turkish in Meydan, a “monthly anarchist gazette,” on 22 October 2014. The English translation appeared on the DAF’s own site five days later. 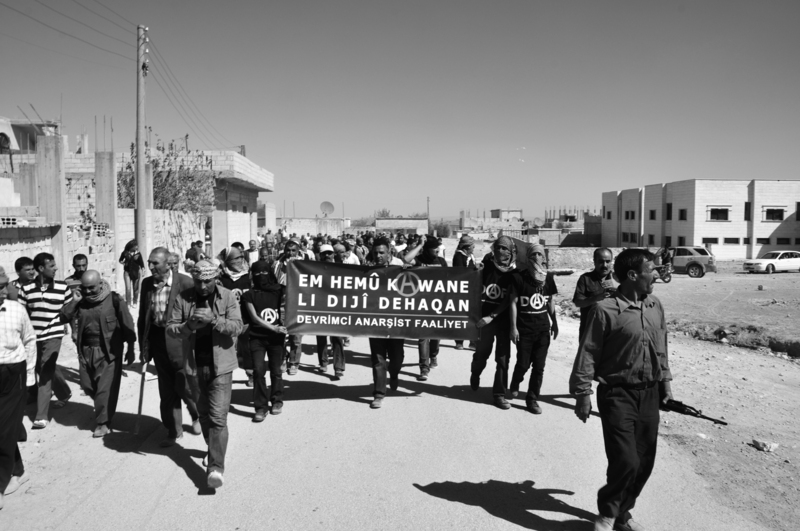 The DAF is a relatively young political organization in Turkey whose name speaks for itself—they announced their active participation in the Kobanê Resistance several months ago. In the coming weeks we hope to provide a fuller profile of this group, their work, and where they fit into the complex political landscape of Rojava—as well as the Kurdish struggle and the Syrian revolution more broadly. For the moment it is sufficient to emphasize that many of the DAF’s allegations about Turkey’s disposition towards ISIS were further confirmed last weekend with widespread reports of an ISIS incursion into Kobanê directly from the Turkish side. Posted on 09/11/2014 by Ed Sutton	in Autonomy, Hearth & Home, People's History and tagged Anarchism, ISIS, Karakök Autonome, Kurdistan, Rojava. AntiNote: Since the battle for Kobanê started making headlines last month, and before that if we may say so, the AWC has been conferring with our invaluable comrades close to both the Syrian revolution and the Rojava struggle and trying to determine how best to present these topics here. Complicating matters, of course, is that news out of Kobanê in particular changes minute to minute—first, the fall of the city was inevitable, then it turned into a lasting siege; then all at once ISIS fighters were in retreat and the battle “over.” But the siege continues, and continues to confound: the roles and statements of the Turkish, American, and many other states shift constantly; people continue to scrape across the Turkish-Syrian border near Kobanê, in both directions; the situation is exquisitely fluid.